Since 2003, I have heard from hundreds or thousands of people say they “tried Google Ads but it did not work.” I have spoken to countless marketing executives who said they worked with “Google Experts” and got bad results. So why do some companies spend so much money on Google Advertising? I have been using Google Advertising since 2003 with more than 1,000 businesses in 50+ industries. There is a reason it is the number advertising channel. I have worked with countless advertisers who literally have an unlimited budget, where they spend as much as they can with Google ads because it is that profitable for their business. Yes, Google Ads works and can drive lots of sales for your business. But there are a few things for you need to know first before turning on AdWords campaigns. If you do not properly setup conversion tracking you are going to get bad results. If you use website technology that prevents analytics from tracking correctly, you will get bad results. Every company that I have ever worked with that complained Google ads doenst work did not have conversion tracking setup and implemented. You can’t manage what you do not measure. And what is measured can be improved. If you measure wrong, you will manage wrong. Split testing is the most important marketing activity to improve results. If you are not testing, you will get bad results from Google Ads! You need to first a/b test and prove which keywords will bring paying customers. On average, only 3% of your keywords will generate revenue for your business. If you pick the wrong keywords, you will get lot of clicks but no sales. Google is the master of wasting a companies advertising budget. 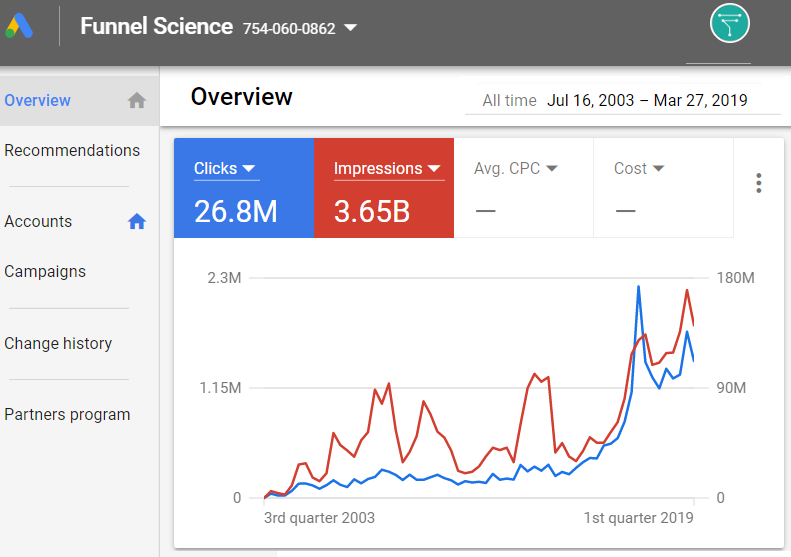 Google sells clicks, not sales. Google will sell you every possible click they can. You have to master blocking, filtering and junk removal to get good results with Google Ads. Most companies experience between 10 – 40% click fraud. Click fraud will eat up your budget and cause very sales poor performance. Click fraud comes from competitors clicking on your ads, mobile apps that hide ads under videos, and 3rd party websites that get paid by Google when someone clicks on your ad on their site. Our average customer has fired 3 different marketing agencies before they hire Funnel Science. At the second company that I founded, we fired 50 marketing agencies. In my experience 95% of marketing companies are some form of scam. They either make false promises or they flat out fail to get any meaningful or real results. Results do not take months to achieve. We see results in as little as 1 week after take over. Anyone telling you that it will take 4 to 6 months before you seen any results is probably scamming you. In the example below revenue increased by 30% in just 1 month. Google ads isn’t for every business though. Some industries are far too competitive for small business or start-ups to enter. Google is an auction and you have to bid to be on top. Companies with bigger budgets do far better than companies with small budgets. There is economies of scale for bigger spenders. As they raise their budget, other companies start dropping out and just cant compete. There are many other advertising channels that are less competitive and far cheaper than Google ads. Sometimes you should first start with Facebook or Bing.